Indiana University School of Informatics and Computing at IUPUI faculty Andrea Copeland, Albert William, Zebulun M. Wood, and Ayoung Yoon recently detailed their local heritage, community-based project, Virtual Bethel, in a new book titled Research Methods for the Digital Humanities. The four researchers authored the chapter, Virtual Bethel: Preservation of Indianapolis’s Oldest Black Church, in the book edited by lewis levenberg, Tai Neilson, and David Rheams and published by Palgrave Macmillan in 2018. In it, they introduced the principles behind 3D imaging, modeling, and representation of spaces and objects, and how they can be used in research, teaching, and learning. Bethel is the oldest African American church in the city of Indianapolis, and was once a vital part of a thriving African American community in the heart of the Indiana Avenue Jazz District. The Church was founded in Indianapolis in 1836, and its archive documents a shared heritage and a living community. Over its 180 years of existence, the Bethel AME Church has played a critical role in the Underground Railroad, the founding of the National Association for the Advancement of Colored People (NAACP) in Indiana, the founding of the first formal School for Black Children in Indianapolis, and the development of the African Methodist Episcopal Church in the United States. 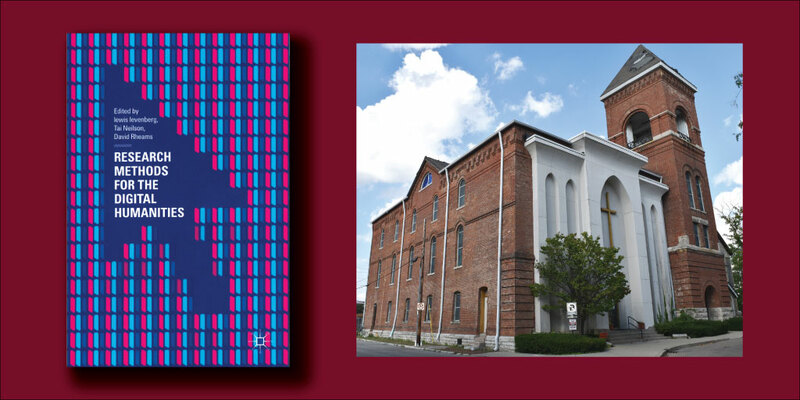 Social and economic influences downtown led to the dwindling of the congregation, the building fell into disrepair, and in 2016 the decision was made to sell it and build a new church in another location. A media arts and science team-based course in 3D production/visualization served as the production lab for this project. Students developed skills in pre-production—story concept and development, script writing, research, conceptual drawing, storyboarding, animatics, and project management—as well as production—3D asset creation, time management, sound and title sequences—and post-production–rendering issues, movie creation, and formatting for playback. Students and faculty worked with the archival documents and physical objects/spaces to learn methods to represent history through new media technology. They also worked with heritage professionals, historians and community experts. William and Wood, media arts and science faculty, collaborated with Copeland and Yoon, library and information science faculty, as well as faculty from history, anthropology, and geology departments in the IU School of Liberal Arts. Local heritage institutions played an important role in this preservation effort and continue to do so. Copeland and Yoon are leading the local cultural heritage project involving the Bethel AME church. Copeland spent three years working closely with the church archivist and historian, Olivia McGee, to preserve and make accessible the artifacts dating back to 1850. The church’s archive now resides at the Indianapolis Historical Society and, through a partnership with the IUPUI University Library, it has been digitized. The Virtual Bethel project provided an opportunity for students to use digital arts technology to preserve and represent physical objects and spaces as well as engage audiences in the exploration of history through new media. It also gave the team invaluable insight into cultural heritage challenges and raised awareness of what is being lost from the collective human experience. “The virtual representation of the church’s sanctuary now provides a vessel to engage audiences in the history of Bethel church as well as the history of African Americans in Indianapolis….We believe this project is worthy of our efforts because of its historical significance, but also because of the injustice to the community brought about by gentrification,” they concluded.